When playing casino and slot games for real money on your mobile, there are plenty of ways to deposit. Some mobile users still choose to use a debit or credit card, whereas others want the option to pay using their mobile phone balance or via text message / SMS. One of the reasons why this payment method (aka Boku) is so popular is that it gives you greater control over your spending and does not reveal any sensitive payment information to any gambling site. The money you are playing with is from your phone credit or bill. Our recommended mobile casinos have payment systems in place so that if you are a phone contract customer, your casino spending will come off your monthly phone bill, and if you are a “Pay As You Go” customer then it will come off your phone credit / balance. Not all casino sites offer this method of payment for mobile users, but those that do are very flexible and do it well. One benefit of a SMS and Smartphone casino is that no payment details are revealed to the company – no card details, no bank details, nothing. So for those who are sceptical about online gambling or just want the peace of mind knowing they are in control of their own security, then this deposit method is perfect. Other pros of mobile phone payments are that it is instant, meaning you can get playing for real money straight away. If you have a mobile phone that is on contract, it is worth noting that by choosing to play casino games via pay-by-mobile, you are effectively playing now, but paying later. For example, if you are depositing cash to a mobile casino using your phone at the start of the month, but don’t pay your bill until the end of the month – then you don’t need to have the funds available until you are due to pay your phone bill. Nothing will be taken from you up front, the payment will simply be secured against your phone bill. 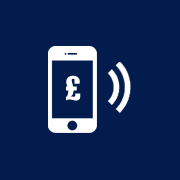 For customers that have a mobile phone that is on a prepay pay-and-go SIM agreement, any money that you wish to deposit at mobile casinos is already accounted for and paid in advance. If you have topped your phone up with £20, you can use any of these funds to deposit and play at an online casino straight away. Therefore, because the money is already there (prepaid), you will only spend what you deposit – no interest, no sneaky hidden charges. The average casino deposit amount using SMS billing is £20-£50. The good thing about using pay-by-mobile casinos is that the popularity is rising fast – bringing more options and more flexibility to the table. SMS billing is hugely popular in the UK now as it is one of the most convenient and safest ways to deposit at a gambling site. Boku is the name of the company that is leading the way for phone billing casinos. More providers are now signing up with Boku in order to provide the flexible payment method taking the United Kingdom by storm. There are 3 main reasons why this payment provider is so popular – it is private, secure and accessible. Can you still claim a casino bonus if paying by mobile? Yes absolutely. But players are reminded to check the terms for the minimum deposit amount in order to claim a bonus. Some casinos set the minimum deposit at £3 or £5, whereas at some providers the minimum is £10 or £20. What games can you play with phone bill payments? Deposit at a casino using your phone bill or credit does not restrict access to games on any particular site. Once the money has been deposited you have full access to all mobile casino and slot games. What happens to money you win if you have paid by mobile? Any real money winnings at a mobile casino are paid to your account and shown in the balance. You are free to withdraw this money (providing there are no wagering requirement terms to be met) using any method of payment that is available at the casino including card, bank, cheque. Can you withdraw winnings back to a Smartphone? You can not withdraw winnings back to your mobile phone or phone bill – it must either go to a bank account or e-wallet such as PayPal. Some casinos do offer cheque withdrawals, which means you can withdraw your winnings via cheque that you will receive in the post. But if you plan to do this always check the small print first to make sure it’s possible. How do you deposit via your iPhone / other phone? Create a new account and attach your mobile phone number to it. Then simply follow the onscreen instructions provided by the casino. A number will be provided that you can send a text message / SMS to with the deposit amount you wish to play with, e.g. £10. Once the transaction is complete the balance will be updated and your account will have funds ready to play. What devices are compatible with mobile casino billing? All mobile devices that have a SIM card or allow you to make calls, such as IOS / Android devices, iPhone etc. What telephone networks support this method of payment? All major UK phone networks support mobile phone billing, including O2, Three, Vodaphone, Virgin and EE. The system works very similar to mobile charity donating whereby you send a SMS and the amount is deducted from your credit or added to your monthly bill.